In this Dec. 11, 2018 photo a participant in U.N. climate conference walks by a photo of a satellite in Katowice, Poland. 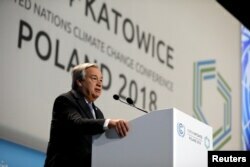 UN Secretary-General Antonio Guterres addresses during the opening of COP24 UN Climate Change Conference 2018 in Katowice, Poland, Dec. 3, 2018. U.N. chief Antonio Guterres opened the talks last week, telling leaders to take the threat of global warming seriously and calling it "the most important issue we face." Harjeet Singh of ActionAid International said the main holdouts were the United States, Australia and Japan, while the European Union was "a mere spectator." "A new leadership must step up," said Vanessa Perez-Cirera of the environmental group WWF. "We cannot afford to lose one of the twelve years we have remaining." "Nobody, even the so-called superpowers, can negotiate with the laws of physics," he said. "It's a question of survival for a large part of humanity, and many other species," he said. Li Shuo, a climate expert at Greenpeace, warned that the current text was riddled with loopholes. "A Swiss cheese rulebook is unacceptable," he said. 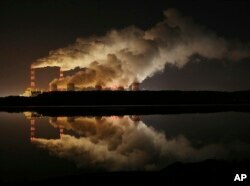 One issue that has risen to the fore at the talks is the proposal by Poland for countries to back the idea of a "just transition" for workers in fossil fuel industries facing closure from emissions-curbing measures. FILE - Clouds of smoke over Europe's largest lignite power plant in Belchatow, central Poland, on Wednesday, Nov. 28, 2018. Germany's environment minister, Svenja Schulze, told reporters that her country is committed to phasing out the use of coal, though the exact deadline has yet to be determined. But in a nod to the recent protests in France over fuel prices, Schulze warned against governments forcing through measures, saying they would lose public support "faster than you can spell climate protection, and then people pull on yellow vests."